The hotel is located in Puerto de la Cruz, in a very quiet residential area next to Taoro Park, one of the leafiest areas of the city. It is about 15 min. walk from the beach " Playa Jardín ", Lago Martiánez and the city centre. We also provide our guests with a free bus service between the hotel and the centre of Puerto de la Cruz. Take a bath in the heated swimming pool (covered according to the weather) and enjoy our free jacuzzi. Totally renewed in 2003, the hotel count with 130 rooms distributed in six floors and two elevators. 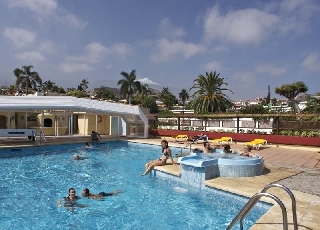 Our 3 stars hotel is located where the eternal spring of the mythical Valley of La Orotava and the smooth volcanic sand of the beaches are united in Puerto de la Cruz, to the north of the island of Tenerife and next to the natural surroundings of the Taoro Park. Our All Inclusive system includes full board and drinks according to the hotel timetable. If you plan not to be in the hotel for lunch, you can order a picnic to take away. In the afternoon, you may have tea time and enjoy the calm of our bar. As specialists in good service, we try to offer you every detail that makes your stay unforgettable. We look for your well-being in our rooms, that, like the rest of the hotel, were totally renewed in 2003. They are all fully equipped with all the comforts of the modern life such as complete en suite private bathroom, satellite TV, minibar/fridge (for hire), sofa bed, piped music, hairdryer, bathrobe, water boiler, and safe deposit box (for hire), bathrobes, ceiling fan, and balcony or terrace. Rooms are luminous and bright thanks to its big windows which open into the terrace. They are nicely decorated in bright colours which creates a cheerful atmosphere. Por la tarde, usted puede tener tiempo del té y disfrutar de la calma de nuestro bar. Como especialistas en buen servicio, intentamos ofrecerle cada detalle que haga su estancia inolvidable. Nuestro Restaurante-Golpear las ofertas usted el mejor de cocinar internacional y del local y de un servicio modificado para requisitos particulares. En nuestro Bar, usted podrá encantar su bebida preferida. En las terrazas superiores hay la piscina condicionada con el Jacuzzi, cubierto según la climatología, el Bar de la piscina y el solarium.